Most lists of winter gear include hats, gloves, long coats and boots. Source: PhotoXPress. Russians and expats offer some suggestions for things to take with you and things to avoid. The part of the year directly following the Epiphany (called “Kreshenskye morozy,” or “Epiphany frosts”) is well known as the coldest time of the year in Russia. 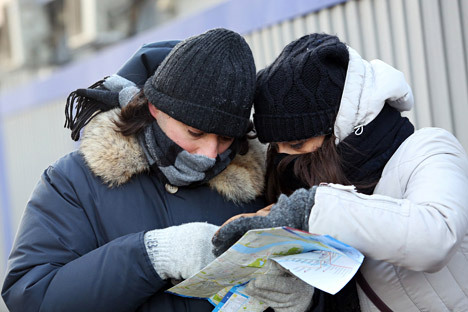 For travelers who plan to brave this part of winter in Moscow, here is some sound advice from local Russians and expats. A former resident of the Russian capital, Linda Stacey, said this: “My son flew to Moscow in December from Australia and arrived in shorts and flip flops!” Although, you might want a swimsuit, if you plan to join the “Morzhi” (Russian for “walruses,” to describe people who enjoy “polar bear swims” or winter swimming) for a dip in the icy water. Most lists of winter gear include hats, gloves, long coats and boots. A lot of Russians keep warm in furs, which are easy to buy here, at a price; fleece and wool provide animal-friendly options. Shaun Walker, a Moscow correspondent for the UK’s Independent Newspaper, included cold weather wear in his report on a trip to Yakutsk – Siberia’s coldest city. “Starting from the feet and working up, I'm wearing: a pair of cotton socks, with a pair of thermal socks over them; a pair of ankle-high Gore-Tex boots …,” he wrote. The list goes on, in addition to thermal underwear, padded coat and hat, to include: “a thin pair of woollen gloves (so that when I take the outer pair off to take photographs I won't expose naked flesh),” underneath “a pair of gloves made of wool and Thinsulate.” Even so, Shaun only lasts 13 minutes outdoors. In Moscow, by contrast, Walker comments that “a good, solid winter coat” is usually fine. You can buy or rent ice skates and skis all over the city, but for those who want to explore the city and parks on foot, icy surfaces can be a problem. Two pieces of gear that help walkers stay upright are “Yaktrax” (spiked attachments that you can slip onto your boots or shoes) and/or Nordic walking poles. Ironically, neither of these is readily available in Moscow, so you might want to think about investing beforehand. If you’re planning to go deep into the forest, a hypersonic dog whistle can also be handy for warding off stray canines. British photographer and long-term Moscow resident, Henrietta Challinor, wryly observes “a reliable watch is important so you can be sure you have the right time when it’s still dark at 10 a.m. … oh yes, and a camera that is well sealed to cope with temperatures below minus 25.” Several people have horror stories about fancy cameras suffering cracked lenses, so this is sound advice for anyone wanting to capture the picturesque snowscapes. Nearly all culinary comfort blankets are available in the upscale grocery shops of modern Moscow, although you can often expect to pay several times the price you would at home. British travelers should be warned that marmite is one of the rare exceptions. A sense of fun and adventure are your biggest assets on a trip to Moscow. If you’re prepared to explore and keep an open mind and a sense of humor about the inevitable challenges, you will find it a beautifully rewarding city in any weather.